Though I believe it’s important not to get completely caught up in our thoughts, mental chatter and the stories we tell ourselves, they do play a large role in our daily lives. It’s simply not possible to get rid of the mental processes our minds go through during everyday activities. We might reach a state of few thoughts or a place where we can sense the underlying ‘no-thought’ self when we relax and meditate, but this is generally not “sustainable” state full time. Sooner or later the tasks we need to complete and the interactions we have each day with other people will intrude. Very skilled practitioners can reach a stage where they allow thoughts to pass by, whilst retaining a sense of connection to the greater ‘whole’ that is part of us all. As we learn to relax further and discover those aspects, it’s useful to examine what sort of thoughts make up our daily narrative and how this relates to the mind and body. In other posts, we’ve discussed the inter-relatedness of the body and mind. Too often people see them as separate things which happen to share a space inside a person. This is far from the truth. However, since that is a big topic of its own I’ll simply say that we are whole beings and our mental and physical processes are inextricably linked. So how should we examine our mental chatter to gain access to deeper levels of relaxation? The simple answer is to pay attention! This sounds easy, but it can be quite complex. 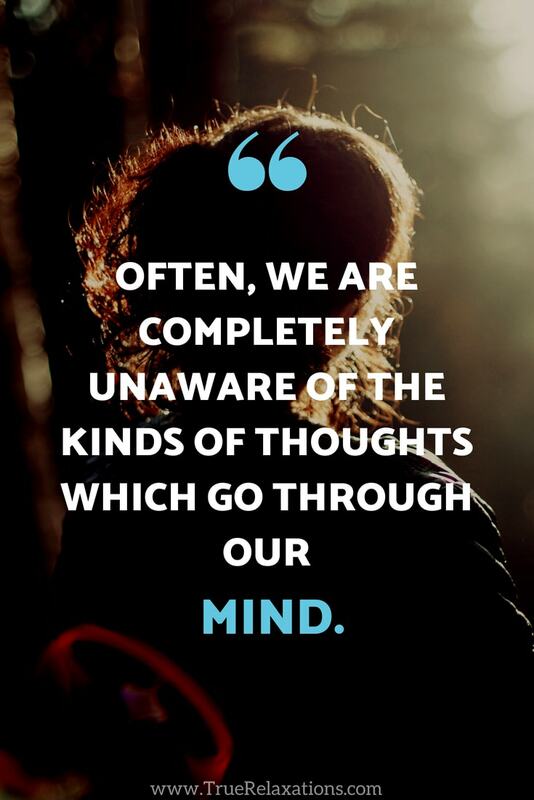 Knowing ourselves and what kind of thoughts we routinely think, and how they play on our levels of disconnection, stress and non-relaxed state can take time and concentration. Often, we are completely unaware of the kinds of thoughts which go through our mind. We’re capable of processing an incredible amount of information each second from our environment. 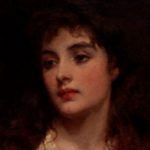 The things we see, hear, taste, touch and smell every moment add to the rich tapestry of thoughts already happening in our imagination-engine (our distinct mental landscape). Add a further dimension in our emotions – how we interpret and feel about information, and it’s true to say that we know very little on a conscious level about how we think the way we do. Take some time each day, preferably at the same time each day, or during a task we often repeat (could be checking our emails in the morning, doing the washing up, chatting with our partner – whatever you do regularly, but take for granted) to try to identify what ‘mental chatter’ or repeating negative thoughts are happening. Breathe in and exhale slowly three times and think of what you are currently doing, and how much of your mental chatter is focused on another issue. Recognise the issue and see if it comes up regularly. There’s no need to judge it or try to get rid of it just now, simply recognising it is an important first step. Ask yourself how this thought is making you feel and how it might be affecting you whilst you complete your task. You might find for example that when opening your email you find repeating thoughts are happening in the background regarding a work stress or worry about finances. We all have them, particularly during periods of distress or dis-ease. We might find ourselves slipping into repetitive or even obsessive thoughts about all manner of worries and events. Being unhappy at work, or worrying about a relationship and often lead not only to that 4am ‘wide-awake’ feeling, but also run as a background of anxiety as we go about our daily tasks. The result of this is we become more and more disconnected from our ability to relax, and these ‘background noises’ can affect the way we respond to other people and the world around us. 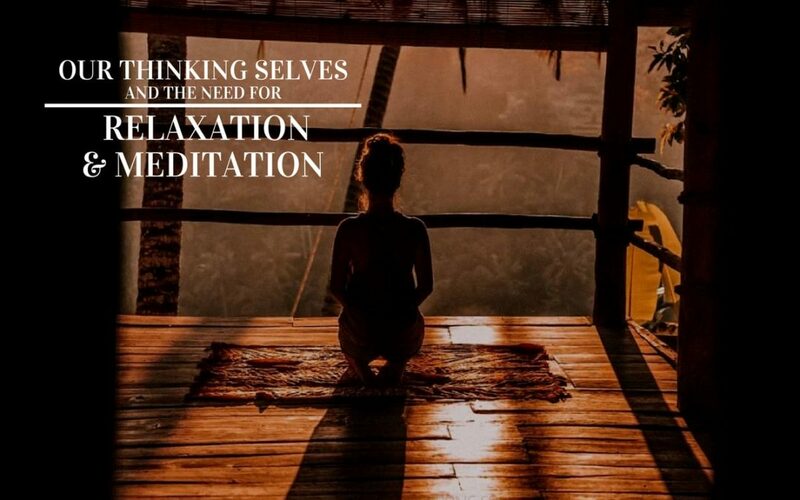 Whilst we might become aware of this during meditation for example, or when taking a relaxing walk outside in nature, it’s also important to be aware of these ‘mental programmes,’ when we are not consciously focusing on relaxation. Then we can put short and simple techniques like deep breathing, listening to a piece of uplifting music, helpful tools like floatation tanks or simply taking a few minutes to consciously re-centre ourselves into place. As time goes on you might be surprised by how often your mind is playing a ruminating loop, even whilst you believe you are focusing on another area! 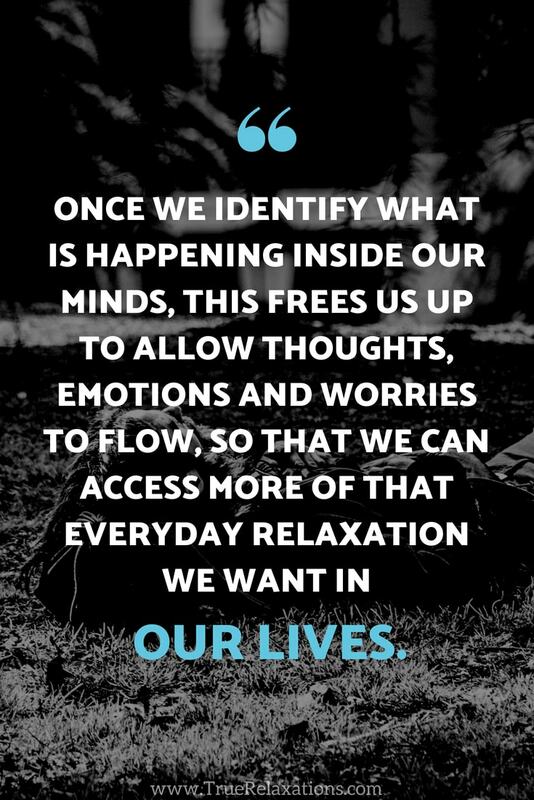 Once we identify what is happening inside our minds, this frees us up to allow thoughts, emotions and worries to flow, so that we can access more of that everyday relaxation we want and need in our lives.